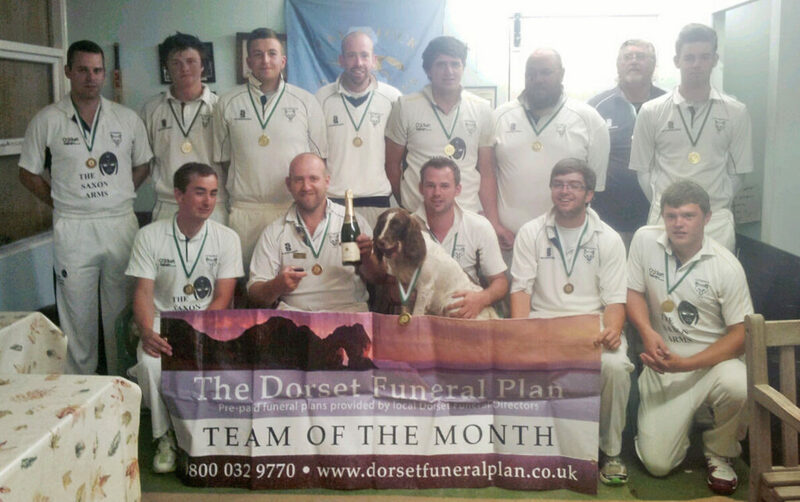 Cattistock Cricket Club won the Dorset Funeral Plan Cricket League Team of the Month award for June after scoring vast quantities of runs. They beat their club record when they posted 348 against Bournemouth IIIs, then the following week topped that with 362 against Wimborne and Colehill IIIs. In that game Steve Tucker scored a massive 158, which included 17 sixes. He brought up his ton off just 33 balls and all but four of his runs came in boundaries. Skipper Ben Golledge said: “We broke a club record two weeks running and amassed huge scores against good sides and decent bowling. “Against Wimborne and Colehill our scorer was complaining because he ran out of room in his scorebook. Cattistock play in the Dorset Funeral Plan Cricket League, County Division 2. Nick Douch, from the sponsors, said: “This was a well-deserved award because of the huge scores they posted in June. The team received a bottle of bubbly and a trophy and every player was presented with a medal. And even the club’s dog received a medal.